We allowed ourselves to sleep in this morning a little bit because we didn’t have to pack up our campsite. We hung out a bit in the morning and drank our (nasty) instant coffee and enjoyed each other’s company. Eventually, we got ourselves ready to go, and packed a day pack with some snacks and my camera for the day. Waterwheel is a little over a 7 mile hike, so it was going to take us a majority of our day. Side note on clothing: I brought three pairs of running tights for 5 days. I like wearing running tights while backpacking or hiking because it prevents chafing, sunburn, and bugs getting on my legs. They got a little dirty, but I also had the opportunity to wash them in the river, so it wasn’t too bad. I also brought three sports bras, three pairs of socks, and three shirts and also rinsed those in the river on the third day so then when I wore them the fourth and fifth days they weren’t too disgusting. My dad and Karson both wore those hiking pants that you can zip off at the knee. I considered getting a pair of these, but I didn’t really want to invest in a pair and am very comfortable in my running tights. Anything works really, but I would consider wearing long pants because it may be more comfortable in the long run and I don’t think it made me that much hotter. Anyways, Waterwheel is a bit of a rough hike in that the uphill part is coming back. You basically walk on flat ground for about a mile, then walk downhill for around 3 miles, and then turn around and walk back uphill, and then flat again. This trail follows the river very closely, and at times you even get a little misty from the water. There are also places where you can walk out on the granite near where the water is running, which is pretty cool to be able to do. We stopped and ate our lunch at one of these granite patches near the water. The hike is also unique in that there are these huge cliffs of granite that extend upwards next to the river. They hem you in a bit and force you to stay right next to the river, but they make for some amazing views. Side note: granite gets incredibly slippery when it’s wet, so be EXTREMELY careful around the water. There have been a lot of injuries and deaths in the park from people wading into rivers that seemed slow moving and harmless, and the next thing they know they lost their grip and couldn’t regain their traction, and ended up getting injured or even going over a waterfall because the granite is so deceptively slippery. When I got close to the river to take some of the photos I wanted to take, my dad was very concerned and was super careful to make sure I didn’t get distracted and accidentally step into the water at all because I would have slipped and, at best, gotten seriously injured. Don’t go into any water at the park near a falls, in shallow granite, or basically anywhere that’s not a safe pool where you know you won’t slip or could possibly end up on the wrong side of a waterfall. Yosemite is one of the most beautiful places in the world, but it is the wilderness and you need to err on the side of caution. Anyways, the hike starts on flat ground in a sort of forest that runs next to the river. It’s very green and lush, with plants and trees everywhere. As is the case in most of the hikes in the park, there are random granite rocks on the side of the trail occasionally. There were also a lot of mountain jays on this part of the trail, but I couldn’t manage to get a picture because those little buggers are quick. We also saw one of the only redwood trees we saw while backpacking on this part of the trail. I looked up why there were so few of them where we were when I got home (because I love redwoods), and apparently the trees aren’t fans of the high elevation. I can’t say I blame them; I was not a fan of the elevation either. Sorry I know there’s a million pictures, but this part was soooooo gorgeous. I often wish I was as pretty as Yosemite, so I post pictures of the park as frequently as if I am a pre-teen taking selfies on her first camera phone. For me, again, the hardest part of this hike was the walking downhill part. Some of it is uneven, hand-carved granite steps, and some of it is just downhill on a trail, but it is steep and not easy to navigate either way. It also gets super hot because, once you get out of the forest, there is almost no shade along the trail. We reapplied sunscreen pretty much every time we stopped, which was fairly frequently when we were walking uphill on the way back because it gets super tiring going uphill for so long, even without packs. As I mentioned on my last post, the reason this hike is called Waterwheel is because there are sections where the water hits the granite at such a high speed that it pops up into the air and looks like one of those old-time waterwheels that were used to power factories along rivers. I personally didn’t see that much of a resemblance, but I also don’t think we went at a time when the water pressure was particularly high, so we probably didn’t get the full effect of what it looks like when the river is at full capacity. Nevertheless, the hike offered some gorgeous views, and I’m glad we camped the extra day at Glen Aulin in order to be able to do it. This is supposed to look like a waterwheel… I can kind of see it? When we returned back to the campsite, we grabbed our kindles (or GameBoys) and headed back down the little sandy beach I described in my last post. We sat in our chairs and enjoyed the last rays of the afternoon sun while eating some snacks and reading, which is basically my idea of heaven. As the sun started to get lower, we gathered our stuff and went and made ourselves some more dinner. I believe I had the freeze dried fried rice and chicken tonight and I had no complaints about it. As soon as it started to get dark, we went ahead and got into our tents because the bugs started to come out and the temperature started to drop. It consistently surprised me throughout the trip how different the temperature is at night and during the day, but the change really makes you feel like you’re someplace that’s wild and unpredictable; almost like Yosemite doesn’t really want you to be there and you feel rebellious, as though camping is a defiant act against mother nature. Romanticizing aside, the temperature change really did remind me that I was definitely in the wilderness, which is comforting but unnerving at the same time, and I’m not really sure how that can be, but I absolutely love the feeling. Tomorrow would be our last day in High Valley, and then we had to go back to our real lives of jobs and responsibilities and responding to text messages (ugh). We were going to hike back to Tuolumne and then drive home, passing Soda Springs and John Muir’s restored cabin along the trail home. I was bummed to be leaving the next day, but still excited to hike tomorrow and see more of the park and the High Sierra trail. I could have spent weeks up here and been perfectly content. We started off this morning with some much needed but disgusting instant Starbucks coffee (that stuff is seriously gross). Just a side note: for breakfast we tended to eat granola bars and drink coffee and didn’t really have a true breakfast. They do make freeze-dried backpacking breakfasts, but they didn’t seem that appetizing to me, so I just stuck with my granola bars and Belvita crackers. We also never ate lunch per say, but pretty much just snacked all day while we were hiking until closer to dinner time when we cooked up the rehydrated food. I thought I would be super hungry all day, but I really never felt like I was starving and really wanted to eat until we stopped moving, and at that point you’re no more than half an hour away from starting to cook, so feeling like I had enough to eat was never an issue. After we had eaten breakfast this morning, we headed out on the trail. It was a bit chilly, especially right near the water, but it warmed up as the day went on. The trail for today is essentially uphill for the first mile or so, and then you reach a peak and climb steadily downwards for the last 6-7 miles. Going from Glen Aulin to May Lake would have been brutal, but going from May Lake to Glen Aulin is a piece of cake. As we first started walking, my dad was convinced we were lost, and made us stop and look at the map compared with his GPS reading for a solid 10 minutes even though Karson and I were 90% sure we were on the right path. Near the beginning of this trail is also my favorite lake of the trip: Raisin Lake. I was extremely amused that 1. they bothered to name this tiny lake, and 2. they named it after a raisin because that is roughly its shape. I was in love with it. I struggled with the hike this day for a few reasons. One of them is that my shoes are slightly too big and so going downhill murders my toes and my toenails (a few fell off ew). Another is that my pack was slightly too large for me (starting to see a theme here) and walking downhill made it shake even more than usual, so I ended up with some blisters on my hips by the end of day. My dad and Karson had a great time though, and, even through my pain, I had to admit that the views were beautiful. I tried to distract myself by taking lots of photos and having my dad tell me stories about his life and such. These stories pretty much confirmed that I do not have any desire to become a doctor. The hike took about 5 1/2 hours with snack and water breaks. We had to put the packs down a few times because they would occasionally just get too heavy and we would need a break. We took it slow and tried to enjoy ourselves. Because you are walking downhill on what is essentially a trail carved into the side of a cliff, the views are phenomenal. You get dark green trees in the foreground and hazy, snow covered mountains in the background. Views like this are why I freaking love Yosemite. It feels like you’re not in California anymore because the topography is just so different. When we arrived at the campsite, my dad wanted a site that was off the main path, but that meant that we had to walk up a hill every time we wanted to get back to our tent (including if we had to use the restroom or go to the Bear box). We were in an area to the left of the path next to a ditch surrounded by a bunch of trees, which made it fairly dark. This place probably had the most bugs of any of the campsites, but it wasn’t too overwhelming. We just had to be a little careful about leaving our food open when we set it down. While Glen Aulin was my least favorite place to physically camp, it did have some of my favorite scenery of the trip surrounding the campsite. The first thing you see when you hike down into the site is a big waterfall. If you walk out of the campsite and down some rocks, you find a small, sandy beach with a pool of water off the main river. The water was cold, but it felt so good to hop in after not having showered for three days. Karson and I also swam out and went under the waterfall, which made my dad a little nervous because there were a lot of rocks underneath it, but we made it back completely fine with much cleaner hair than before. I really wish my apartment shower had that high of water pressure; I doubt there was a speck of dirt left in my hair, on my body, or clothing after standing underneath it for only about 30 seconds. After the mini-shower, we then proceeded to find a nice flat rock next to the river and fall fast asleep for about an hour. That was probably the best sleep of my life and I woke up feeling great. After waking up from that fabulous nap, we went and made dinner. I can’t remember what entree I had this night, but I did try creme brulee and a freeze-dried ice cream sandwich for dessert. The ice cream was delicious, but I wouldn’t recommend the creme brulee. It kinda just tasted like vanilla pudding and wasn’t super easy to make. It was hard to mix in all the powder and it attracted bees because there was so much sugar in it. If you do want something sweet while you’re on the trail, bringing some instant pudding could be a good idea because it’s light, easy to make, and delicious. Finally we were ready to hit the hay. Side note on pajamas: it gets COLD. I usually wore a long sleeve shirt, a sweatshirt, gloves, a pair of fuzzy running tights I brought just to sleep in, sweatpants, my socks for the next day, and a beanie. That might have been a bit overkill, but I get cold very easily and then I stay cold. My dad and I also read every night before we went to bed, but Karson usually played on his Gameboy. If you’re not a big reader, bringing something to game with could potentially be a good source of entertainment. It’s nice to have something to do at night because you usually go into your tent fairly early because it gets cold and there’s lots of bugs, but most of us can’t actually fall asleep at 8, so having something to do is key. This campsite creeped me out a bit because we were a little isolated from the main camp and surrounded by trees, but I was so exhausted that I passed out fairly quickly regardless. The next day we were planning on staying at Glen Aulin and doing the Waterwheel hike, which is named after the way the river supposedly looks like a waterwheel when the water hits the rocks at a high speed. I was excited to have another hike (like Mount Hoffman) where I wouldn’t have to lug my pack around, and so was looking forward to tomorrow. My dad was also excited because he had never gotten to do this hike before. There were only two more days left in our trip at this point, and I was so bummed at how fast it was going, but super content to be in Yosemite, devoid of cell service, with my dad and one of my best friends. The plan for this day of the trip was to wander over to the Tuolumne Meadows Visitor Center, catch a shuttle to the start of the trail, hike about 3.5 miles into May Lake, set up camp, hike Mount Hoffman, and then call it a day. I would say that this was my favorite day of the trip, because the views from the top of Mount Hoffman were some of the most ridiculously pretty things I have ever seen. This was also probably the hardest day for my dad in terms of physical exertion because Mount Hoffman is a pretty brutal hike, but he pushed through. This was the first day we were hiking with our packs, and I think we were all eager to get on the road. Throughout the trip I had some difficulties because I was using a men’s pack and I am a five foot tall woman, but it was (mostly) fine. We were able to distribute the weight so that, even though it was a bit loose in places, the pack didn’t move as much as it could have because we put all the really heavy stuff way at the bottom. After some final adjustments to my pack, we were off. We started our trip by leaving the campsite and walking the few hundred yards down the road to the Tuolumne Meadows visitor center in order to catch a bus to the trail head. We decided to take a bus there instead of walk because we wanted to have the time and energy to scale Mount Hoffman later, a hike my father had never gotten to do despite backpacking on the High Sierra Loop Trail twice before. While we were waiting for the bus, we scoped out the shirts in the store (spoiler alert: I got a pretty sweet shirt) and I took photos of the meadow across Tioga Road. I also almost got hit by an RV because I wasn’t paying attention. We also were talking with some older backpackers who were telling Karson and I about their past adventures when they were younger, and we got some good ideas of hikes to do in the future. After about 30 minutes or so of waiting for the bus, one arrived and we took the short ride down Tioga Road to the trailhead. There are so many beautiful views lakes and rivers along Tioga Road, including Tenaya Lake, and if I go up to that part of Yosemite again I would love to spend more time exploring places near the water. After the bus dropped us off, we took about 2 hours to hike the approximately four miles to the camp site. It wasn’t particularly difficult, but we weren’t used to the packs yet and it’s entirely uphill. We also had to pause and wait for a donkey train to pass us. The rangers in Yosemite use the donkeys to carry food and other supplies to the luxury camps I mentioned in my last post, and to carry out waste (not human waste, that gets composted). Sadly, I did not manage to get any good photos of the donkeys, but they were very cute and nice. We managed to arrive at the campsite safe and sound and set up camp. The May Lake campsite was definitely my favorite of the three we stayed at because it’s right next to the water. Our campsite was about 40 yards from the edge. Being so close gave me lots of opportunity to photograph the lake at different times, which I really enjoyed. After locking all of our stuff in the bear box, we set off for Mount Hoffman. Mount Hoffman was pretty much the kiss of death for my father. At one point he literally told us to leave him behind because he didn’t think he could make it, but at that point Karson and I were also dying so we just waited until we were all fine to start moving again. Anyways, Mount Hoffman is a brutal hike with 1500 feet of elevation gain in just 1.7ish miles. It’s made even more difficult by the fact that the elevation climb is very inconsistent. The first half mile is very gradual, and you begin to wonder why people complain about this hike, but after you make it up past the trees, it’s straight up the side of a mountain. It’s also very hard to find the trail so you’re kind of just walking up loose rock. Hikers have tried to set up stacks of rocks (called a cairn) that point you in the right direction, but we pretty much lost the trail about halfway up. Eventually, you make it to this sort of meadow area that slopes gradually upwards and on your right is a view of May Lake, to your left are some interesting rock formations, and behind you is actually a view of the face of half dome. After we spend some time recovering at the top of Hoffman, we hiked back with little difficulty. It was kinda slippery because it’s so steep and I slipped a few times but I didn’t get hurt so it’s all good. After we made it back to our campsite, we got started on my favorite part of the day, which is the eating food part. I also had my favorite meal of the trip this night, which was lasagna. If you’re going backpacking, I would definitely recommend that particular rehydrated flavor of food. We pulled our chairs down to the lake and sat and watched the sun go down as we ate our food. It was a perfect ending to a physically demanding and fun day. 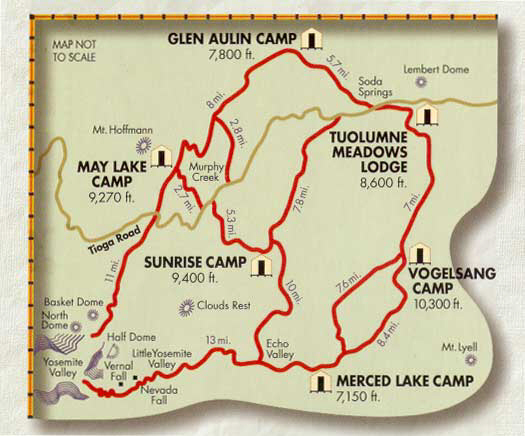 Tomorrow we were planning on hiking from May Lake to Glen Aulin, which is about an 8 mile hike. While this hike is mostly downhill and does have some beautiful views, it was actually the most difficult day for me, but more on that later. High Sierra Loop Trail in Yosemite is easily the best kept secret in the park. When I was there I didn’t meet a fellow hiker who wasn’t from California or who hadn’t been backpacking before. I am fortunate enough to have hiked Half Dome a few summers ago, and I think the views on the High Sierra loop trail are just as pretty with much more variation. Some background on the trail: the High Sierra Camps were created in the 1910’s, were closed for World War I, and then were reopened in 1922 and have been running continuously (if seasonally) since then. This backpacking trail is also unique in that it has semi-permanent structures you can stay in at each of the campsites, and you can order pre-cooked meals if you cannot or do not want to lug all of your bedding/food around on the trail. This option is, however, fairly expensive. I mainly saw older couples or families with young children making use of it. When we went, we brought our own tents and food, but there were a few times I really wished we had ordered food, especially when it came to coffee (my lifeblood). The High Sierra Loop Trail is also nice in that it has running water and composting toilets, so this is also a more doable trail for people who want to ease their way into backpacking (or for experienced backpackers who are sick of peeing in the woods). Fun fact about this particular backpacking trip: We had planned to go in July, but then I came down with the never-ending pleasure that is strep throat, so we had to reschedule the trip. Luckily, my dad worked some sorcery and we were able to get another wilderness pass on very short notice. But, in the end, it was a good thing that we had to postpone the trip because then my friend Karson could come along with my dad and I. As for gear on this trip, each of our packs weighed around 35 pounds (in case you’re wondering, that’s about a fourth of my body weight and yes, it was rough). We each had our own tent, sleeping pad, sleeping bag, and sleeping bag liner. We also carried all of our own food, clothing, and toiletries. We had dehydrated backpacking food that you can find at store’s such as REI, and it was surprisingly good (although I have never tried it when I’m not starving after hiking for most of the day). We also each brought a kindle and our phones, although we did not have cell service once we were on the trail. I also schlepped my mom’s nice Canon camera around, which is why the photos on the blog posts relating to this topic are much higher in quality than photos will be in future posts. The three of us left bright and early on an August morning headed for Tuolumne Meadows camp site. It takes about five hours to drive to the entrance of Yosemite when we start where we live on the lovely central coast, and another hour or so to get to Tuolumne Meadows after entering the park. My dad had me drive for the last second half of the car ride, and I made everyone incredibly car sick as I whipped around the curves heading up to High Valley. If you do ever make it up to High Valley, I recommend not being the driver once you enter the park because the views are gorgeous, and it’s hard to properly appreciate them when you’re focusing on not driving your car and everyone inside of it off the side of a steep cliff on the twisty road to get up there. We arrived around one in the afternoon and set up camp in a nice site towards the rear of the backpacking campsites. Not that it’s a competition, but I definitely set up my tent first. We also locked up all of our foodstuff and toiletries in a bear box, which was something we had to do every night. Fun fact: bears will break into your car (or tent) if they smell chapstick, especially if said chapstick is fruit flavored and/or smells like food. As an avid chapstick user, I do not like this fact. After we made camp, it was decided that we had enough daylight left to hike Lembert Dome and off we went. Lembert Dome was named after Jean Baptiste Lembert, a homesteader in Tuolumne Meadows in the 1860’s. John Muir called it Glacier Rock, but Lembert Dome is the name that stuck throughout the years. Lembert Dome is a relatively easy hike that takes you, as the name implies, to the top of the dome. It’s 900 feet of elevation gain in 1.5 miles (approximately 3 miles round trip), so not terribly difficult. It was really beneficial for us to do this short hike right when we got there because it helped us adjust to the altitude. The altitude really isn’t that bad in high country, but we live at sea level (aka zero elevation) and when you’re 8,500 to 9,500 feet above what you’re used to, you can definitely notice yourself breathing harder than normal. The hike itself is gorgeous. The first part of the hike is in a forest and then you emerge and climb the dome until you reach the top. The view from the top is awesome. It was, unfortunately, a little hazy when we were there due to wildfires at the time (which is why the pictures look crummy), but it was still clear enough to see all the way to Unicorn and Cathedral peaks off the eastern side of the dome. In between those mountains and Lembert dome, there’s a sea of trees that reveal the topography of gentle hills that lead the way to the rocky, tree-sparse mountains in the distance. If you walk over to the western side, you have a sweeping view of Tuolumne Meadow with Tuolumne River curving lazily as it cuts itself a path through the meadow. Exploring the top of the rock and getting to see a slightly different view with every step was definitely my highlight of the day. If you do wander around (which you should), be super careful. I accidently twisted my ankle on a part of the dome that slopes down at a steep angle because I was staring off into the mesmerizing views and then it was hurting a bit for the rest of the trip. After returning from Lembert Dome, Karson and I sat in his hammock we had set up before we left for the hike and watched my dad struggle with the Jetboil that we would shortly be cooking our food with. He (eventually) got it working after a solid five minute panic that he had accidently packed an empty canister of propane instead of a full one, and then we heated up the water that would go into our food to rehydrate it. Pro tip: don’t buy the curry. Just don’t. Side note: the way you cook rehydrated food is by boiling water, putting the boiling water in the bag full of food, zipping the bag up, shaking the mixture a bit, and then letting it sit for 5-10 minutes. Forget the 8 mile hikes, sitting there waiting for our food to be ready was easily the most difficult part of the trip. Also, really really make sure that the bag is zipped before you shake it, or, similarly to the idiot that I am, you will spill boiling hot water all over your shoes. Although I can promise you that you will only make that mistake once. Finally, it was time for bed. We went to bed pretty much as soon as the sun went down because we planned on getting an early start the next morning. I read a little bit of the new-at-the-time Harry Potter play before I went to bed (spoiler alert: it was not good). Tomorrow we were heading out to May Lake via Tioga Road and doing our first hike with all of our gear on.